There is an ancient fort which has been in existence for the last 1800 years . It was here that Razia Sultan, the first woman to take charge of the Delhi throne was incarcerated on her defeat and dethroned . The bricks of the fort date back to Kushana period when emperor Kanishka ruled over India . Bhagwati Mandir A folklore says that in the 17 century , Kamalu Bhagat , a resident of this village accompanied a tapasvi called Kalu Nath for a visit to the temple . On a short distance from Jawalamukhi temple , Kalunath lit his holy fire and prayed . It is said that Bhagwati Mata appeared on the scene . Impressed by this Kamalu Bhagat , on return to his village , started worshipping Bhagwati Mata at the place of the present temple . It is believed that the worship at Maisor Khana on the days of the fair is as sacred and sanctified as worship at Jawalaji temple . DAMDAMA SAHIB It was the jungles of Bhatinda that Guru Gobind Singh ji is reputed to have once challenged and fought the mighty Mughal forces . 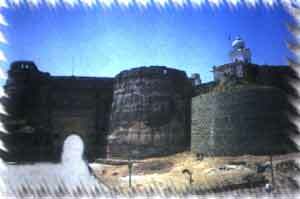 Bhatinda is one of the oldest towns and has many historical attractions . The holy place of Damdama sahib or Talwandi Sabo known as ' Guru Kashi' for the Sikhs has a number of historical associations with Guru Gobind Singh Ji . The Guru stayed here for about 9 months and completed the recompilation of Guru Granth Sahib . This was the last prominent place in Punjab visited by the Great Guru . A number of monuments connected with the memory of Guru Sahib are worth seeing here. The fair of Baisakhi of dancing devotees and display of martial arts is held here for two days in April.